This was the best freeze frame of the bunch—by far. The following is a post sponsored by Brooks Running. For our sponsored post policy, click here. Something I’ve learned about myself as we’ve done more and more video? I make some really, really wonky faces. 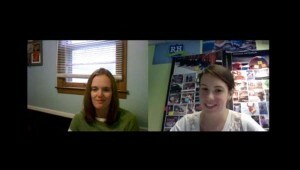 Case in point: this video of an interview I did with Lauren Wall of Brooks Running. I got to meet Lauren when I went to New York City for Brooks earlier this year, and she is seriously so darn good at her job and as sweet as can be. She heads up the women’s apparel department at Brooks Running and is super passionate about what she does and why she does it. I could talk to her for hours about what fabric they use here and why they put this there, etc., etc., etc. (She’s also a big fan of thumb holes, which I adore her for!) However, I do have a tiny bone to pick with her—and it’s about those wonky faces I mentioned. During the interview, my internet connection went all slow and our Skype video call kept freezing up on screen. When doing so, I was frozen in time with bad face after bad face. But Lauren? Poised, smiling and fresh as a daisy.